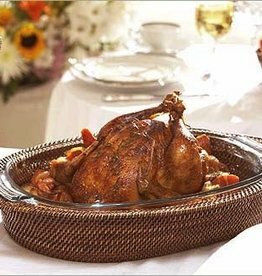 Coated reed hand woven in the Philippines, making a handsome yet casual presentation from oven to table. We love this piece for roasted meat or mac and cheese, cobbler or other favorite casseroles. Woven Reed Oval Pyrex Holder with Pyrex Bakeware - 4 Qt. Coated reed hand woven in the Philippines, and includes the 8x8" Pyrex baking dish, making a handsome yet casual presentation from oven to table. Coated reed hand woven in the Philippines, and includes the 3.5 quart Pyrex baking dish, making a handsome yet casual presentation from oven to table.